As you might already know, HiFashion is a member of British Style Bloggers and we've both done Guest Posts there. "Its about showing everyone that they are beautiful, just the way they are. It’s about making people stand up, and step out with their heads held high, and a massive smile on their face. It’s about showing that everyone has something they hate about themselves. It’s about showing that there’s so much more to body image than size". Well, I got into "the fashion industry" through Lipstick Royalty Magazine, which I started writing for when I was fifteen. A major part of what we did was about body image, and as fashion editor I always payed a good deal of attention to that kind of thing - I'm not exactly what you'd call a natural-born fashionista, and one of the things that convinced me that fashion wasn't evil was the way we worked at LR. So, when we started talking about Fashion Activism at BSB, we realised we had something truely amazing going on - if you look at Gala Darling or Tavi, you can see what a massive influence fashion bloggers now have, and we thought that we could use that to make a big difference. Body Image is a massively important topic in so many areas of society at the moment, but especially fashion, that when my lovely intern-type-assistant-type-superstar (whose 'job title' I change daily, as you can tell) Rachel wrote a sample post for me about it, the idea just clicked. Fashion Bloggers can make a difference in the world - and so we should, I think. 2) What kinds of posts and information can we expect to see from it? 3) What do you hope to achieve by running this campaign? 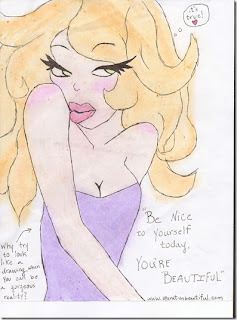 4) What advice would you give a young girl who's worried about body image? 5) What, do you think, is a major, global, problem with this issue? Oh, God, it's definitly the media portrayal! I can say that with absolute certainty. 110%. Even if one magazine does one photo-shoot with "plus sized" models, for example, it turns in to a PR opportunity. It's all so superficial; "oh yes, we're doing good. We're stopping anorexia. Look. We're awesome. Now buy our magazine forever more despite the fact it was only this one shoot". That sounds really cynical, doesn't it? I hope people know what I mean; the "anorexia" issue has become a band-wagon. That's why we're not looking to combat anorexia - it's been done. We're looking to change attitudes, and to cover every aspect. There is so much more to this than eating disorders. 6) If you could change one thing about how the world percieves body image, what would it be? So keep checking back at BSB to see the latests posts and details about the campaign! P.S. 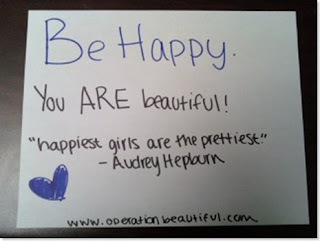 While looking for images for this post, I came across Operation Beautiful. Its a simple Operation. All you do is write positive and inspiring little notes on post-its around for strangers to see and feel better. I don't know about you, but I can't wait to do this. Amy! You totally but unintentionally lifted my campaign goal from my documentary! But I don't mind - its the perfect goal! Im glad someone can admit that the whole magazine putting plus size model in there is just to sell a magazine, it doesn't mean much, hopefully one day it will. Great post! And I love that Audrey quote because it is SO true. Confidence really does make us more beautiful. This is fabulous... it was like reading some of my answers to your interview questions. I totally agree with everything she said. Good interview, I did not know that you are involved with BSB, though! Fantastic post and interview! Fashion bloggers definitely can make a difference! This is what I like to hear! Good for her!! She's doing such positive things! Great job posting this! The size / plus size / body image never seems to end. Nice to read an interview with someone who has a balanced perspective! I hate to be a killjoy, but as long as the bloggers don't start to boycot certain brands who do unrealistic ads or have skin-and-bone-models I think the campaign won't have much influence. As long as we see these pictures with the skinny, flawless, photoshopped models on them we will we manipulated - pictures are very powerful. Sherin - good for you for being involved in something that will boost young women's self esteem and remind them that there is more than just being a size 0 and being skinny. It is about loving yourself and the beautiful person within, no matter the size! XO!